People love to travel and increasing numbers of tourists are exploring our beautiful country in Camper Trailers and motor homes. If you have a spare camper trailer or two, renting it out can be a great way to supplement your income as long as you are clear about the terms of the rental arrangement. As the owner of the camper trailer you want to protect your asset. You want to make sure that the person hiring your camper takes good care of it and that you are not liable for any damage caused by the vehicle. will not overload the vehicle and so forth. The best way to ensure that your hirer clearly understands their obligations is to use a written rental agreement. A written rental agreement eliminates confusion and misunderstandings, and provides you with a clear paper trail. Use this agreement when renting a camper trailer to a third party. It covers the following essential provisions. We have not shown the whole agreement - just a couple of snippets. 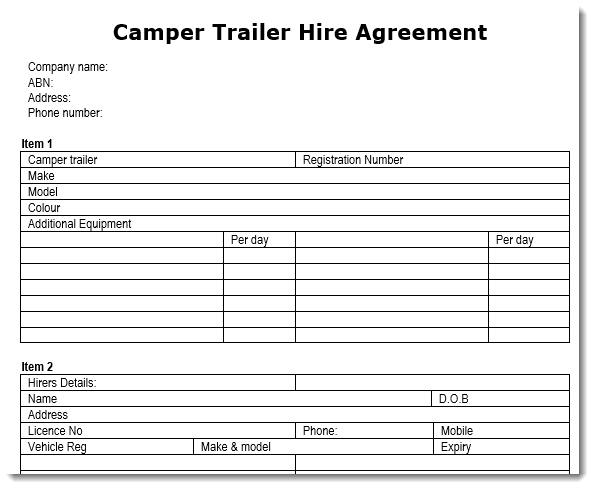 This camper trailer rental agreement template has been professionally drafted and formatted for your convenience using Microsoft Word, it can be downloaded immediately as an MS Word template. You can use this template time after time, simply insert the correct information in the appropriate fields and tab to the next field. Now print your professional agreement! Our fully secured ecommerce system allows you to purchase and download your Agreement safely. In just a few minutes you can have everything you need to protect the interests of all the parties involved.